Your very first ride down the steep slopes of a bona fide mountain on a rock strewn trail on an old bike will undoubtedly leave you convinced to the necessity of purchasing a strong and resilient mountain bike frame! It, as your body will attest, is going to absorb a lot of shock. If you invest in a good mountain bike frame, it will do even more: it will actually absorb, into its metal and components, much of the shock that would otherwise move readily into your own components! Design and construction of mountain bike frames has advanced centuries in the last couple of decades, really. What is available today only remotely resembles the first so-called mountain bikes some of us rode in the early nineteen-eighties. 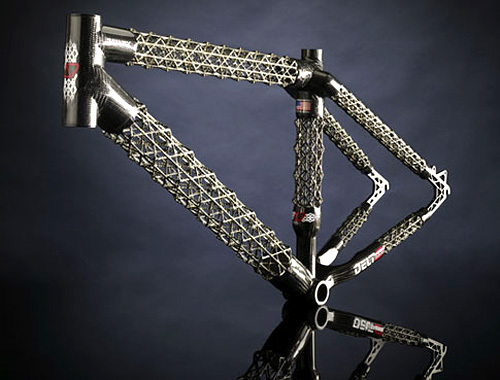 Today, mountain bike frames are available in geometries and materials unimagined two decades ago. What you need is going to be a combination of your own body and your individual intentions. If you like the thrill of high speed downhill rides, you will need a vastly different bike than if you ride on level trails. If your preference is to avoid going over rocks, you will need a different bike than someone whose eyes light up at the sight of a boulder strewn pathway. Think about what you enjoy before you go shopping for a mountain bike. Mountain bike frames spend a lot of time on roads these days, too. Most of the bikes seen around town seem to be mountain bikes or some hybrid of the mountain bike. Fact is, mountain bikes are made for comfort. What they add to genuine off-road riding (shock absorption, easy gearing, and responsive handling) may be essential but what they add to street riding (shock absorption, easy gearing, and responsive handling) is no less appreciated by the casual rider. You will even find mountain bike riders on most any of the long, multi-day road tours so increasingly popular. You will not, probably, find these riders among the front pack though: a mountain bike frame is not made for efficient road usage, even if it does add comfort. Getting a mountain bike frame that's right for you is possible either in person at a good bike store or online if you know your size and usage requirements, but the vastly different frame geometries make riding a bike before buying it more important than ever. The traditional triangular structure of a road bike frame is frequently drastically skewed on today's mountain bike frames, rendering the triangle almost unrecognizable. Shopping at a good bike store will put you in touch with bike professionals who will be able to recommend the right geometry for your unique physique and your own unique preferences and strengths as a rider.